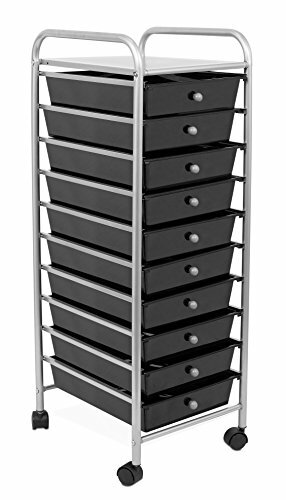 Internet's Best Rolling Cart Organizer | 10 Black Drawers | Classroom, Home or Office Storage Organization Bins by Internet's Best at Momiji Studios. MPN: 10478. Hurry! Limited time offer. Offer valid only while supplies last. Internet's Best Rolling Cart Organizer is equipped with 10 storage drawers allowing you to store classroom, craft, tool and office supplies easily. Internet's Best Rolling Cart Organizer is equipped with 10 storage drawers allowing you to store classroom, craft, tool and office supplies easily. The cart is crafted with caster wheels (2 locking wheels) allowing the cart to roll around the house, classroom and office. Each drawer may be removed so you can simply transport one drawer to the table, desk or around the house without moving the entire unit. The rolling cart's frame is constructed from durable steel metal with a soft grey finish. Easily store and transport your classroom supplies with Internet's Best Rolling Cart Organizer.